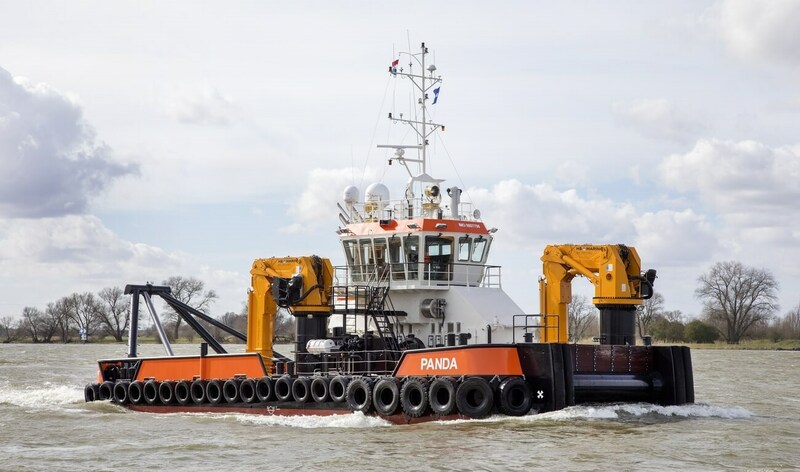 Home › Utility / Support Vessel › Multi Cat › Multi Cat 2712 › Multi Cat 2712 "Panda"
On Thursday March 23rd, 2017 the Damen-built Multi Cat 2712 Panda was named at our yard in Hardinxveld-Giessendam. Mrs. Kok den Breejen, niece of Mr. Jack van Dodewaard, performed the naming. Multi Cat Panda is the second Multi Cat in the fleet of Herman Senior B.V. and slightly bigger than the first one named ‘Yogi’. With a bollard pull of 33 tons she travels under Bureau Veritas class and carries the Dutch flag. She also has an unlimited navigation area without restrictions. Panda will be used on various maritime projects.